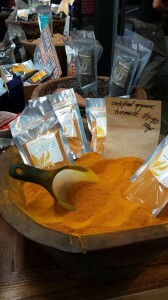 Honey Lady Turmeric Honey still has the sweetness of honey with the mild earthiness of Turmeric. Our Turmeric Honey is 100% Raw South Australian honey blended with Organic Turmeric – a double whammy of health properties! Honey Lady Turmeric Honey is available in 200g, 325g & 700g jars and can be ordered at the Honey Lady Online Store or from one of our fantastic Honey Lady Stockists.